Quick anatomy lesson. The thoracic spine is the part of your back in between your cervical spine (neck) and lumbar spine (low back). There are 12 vertebrae and your ribs attach to this part of the spine. The cervical spine and lumbar spine get all the hype. We all have woken up with a stiff neck before and quickly realized how limiting this type of pain could be. While it’s much less typical to experience this type of pain in the thoracic spine, it is not to be neglected when treating the pelvic floor. The thoracic spine is the mid part of the back consisting of 12 vertebrae. Physical therapists are looking at your posture from the moment you walk through the door. Why? Because posture is important. Between driving in the suburbs and the type of work many of us do, we spend a lot of the day sitting hunched over. As time goes on, the thoracic spine adapts to this and starts to feel at home in this over rounded shape. It’s much harder to maintain good alignment at the pelvis if there is restriction up the chain. Poor posture can worsen symptoms of many pelvic floor conditions like pelvic organ prolapse and coccydynia (tailbone pain). Yes, I’m talking about breathing again. If you aren’t breathing well, you’re not optimizing pelvic function. Breathing improperly can be detrimental to nearly all pelvic floor dysfunctions from pelvic pain to pelvic organ prolapse. The ribs attach to the thoracic spine. A tight thoracic spine limits rib movement with each cycle of breath. The transverse abdominals (TrA) are your deepest layer of muscles in the abdominal wall and they primarily stabilize the body during movement. Improper activation of the TrA can negatively impact constipation, pelvic pain, and conditions like diastasis recti just to name a few. And where do the TrA attach?….You guessed it. They attach to the thick sheet of fascia coming off the thoracic spine. Could you seemingly spend all day stretching your hip flexors and still feel that they are tight? 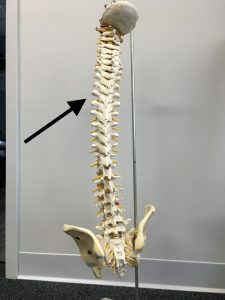 You probably haven’t thought about the connection of the hip flexors to the spine. The psoas (one of the muscles that makes up the hip flexors) begins on the thoracic spine at T12 (vertebra 12). Pesky tight hip flexors contribute to poor posture and even pelvic floor dysfunctions like constipation. Here are a few exercises to improve thoracic spine mobility. Roll across the mid part of your back. Roll with a foam roller horizontally over the mid part of your back. Play around with different arm variations. Use a long foam roller (or half roll). Support yourself from the base of your skull to your sacrum and bring your arms out to the side. Remain here for a few minutes allowing your spine to soften and heart to open. The following two links are for additional exercises for thoracic mobility. At Hudson Valley Physical Therapy, we look at so much more than the pelvis when it comes to helping our patients manage pelvic floor dysfunction.